Opening hours: Many shops are open seven days a week (except Christmas Day and Good Friday) from 9am and 5.30pm although hours vary. On Friday nights shops are open until 9pm. 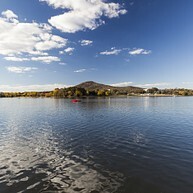 Over half the area of the Australian Capital Territory, ACT, is a national park, with a well-developed and maintained network of walking trails through mountain ranges and sub-alpine forest. 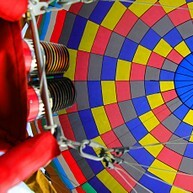 A spectacular way to see the city is to take a hot air balloon ride high over Lake Burley Griffin. The surrounding region offers more than 30 wineries, historic townships, beautiful coastlines and the famous Snowy Mountains. 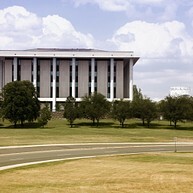 The National Library of Australia was rebuilt in 1968, and inspired by the Parthenon. Australian copyright law requires that a copy of every book published in Australia is to be deposited with the National Library of Australia. Although the library has “closed access”, it also holds a national bibliographic database and offers access through the Libraries Australia service. 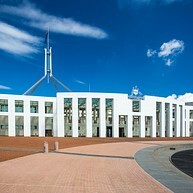 The New Parliament House, the seat of Federal parliament, was completed in 1988 in time for the bicentennial celebrations of the first settlement by the British in 1788. The futuristically designed building features the use of native timbers and contemporary art work by Australian artists. 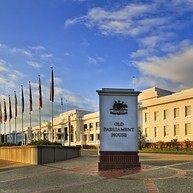 Built in 1927, the old parliament house served as the seat of government until 1988, and is now open for tours through the chambers and corridors of power. The lovely Rose Gardens on either side of this national heritage site are a visual delight. Spectacularly situated on Acton Peninsula thrusting out into Lake Burley Griffin, the museum explores the events, issues and people that shaped the nation. With all the historical material The National Museum of Australia really holds a rich and diverse collection. The Australian war memorial serves both as a memorial to Australians who served their country and as a military museum. The building, roughly shaped like a Byzantine church, is a revered national shrine. The National Gallery of Australia holds a comprehensive collection of Australian art including a superb collection of Aboriginal art. The gallery also hosts special interest exhibitions from around the world. 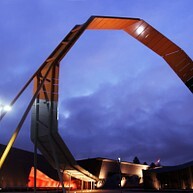 The interactive science and technology facility, Questacon, really delights its visitors. Both young and old will be entertained by walking around discovering hands-on exhibits and much more. Explore the lake either by walking or cycling the many pathways around the lake shore or take a cruise on the lake. Are you ready to get a little dirty? 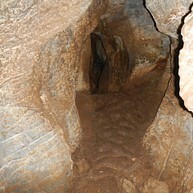 Explore the Wee Jasper Caves near Canberra for a different and thrilling caving experience. As you descend into darkness, you will be able to see the rays of sun slowly getting thinner. Wee Jasper Caves are known for their peculiar limestone features and they are sure to take your breath away. Soar up into the skies above the Australian capital and see its top attractions below as you slowly drift through the air on board a graceful hot air balloon. Memories made during the experience will most probably last a lifetime. The National Zoo & Aquarium is a combined zoo and aquarium. 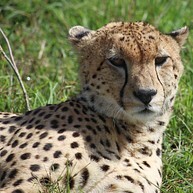 Just five minutes from Canberra you will find this entertaining park with a wide variety of animals. The Floriade is an annual event in Canberra that celebrates spring. Visit Commonwealth Park and a rough estimate of one million flowers in bloom. Wander around in the park and enjoy all the colors at this world-class festival. 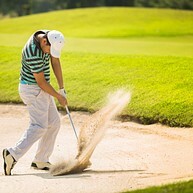 For a good game of golf at one of the best inland courses in Australia, pay a visit to the Royal Canberra Golf Club. Walk around at this picturesque course among trees, pines and Australian natives. 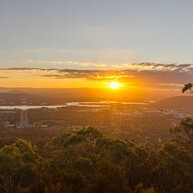 Get one of Canberra's best views from Mount Ainslie over the Parliament House and the Australian War Memorial. Drive, walk or bike up the mountain for a spectacular view during the day or a beautiful sunset.